Sorry for the lack of posts, everyone. ANOTHER relative had a heart attack. Second, in a month. UGH! He’s fine, but everything has been REALLLLLLLLLY stressful since then. I just got done reorganizing the makeup I take out on shoots though it’s still only a fraction of my total makeup, since I’ve weeded out many of my bright pigments, and all of the eyeliners, foundations, etc. that are for my personal use. Still, I was in shock how fast it filled up my new container. There’s also panels on the lid that store my eyeliner right now! Yay! The bottom has three plastic trays, containing my MUFE Aqua Creams, Flash Cream palette, Givenchy foundations, Sugarpill, Urban Decay, and Stila eyeshadow palettes, Graftobian powder foundations, blush, highlighters, etc. 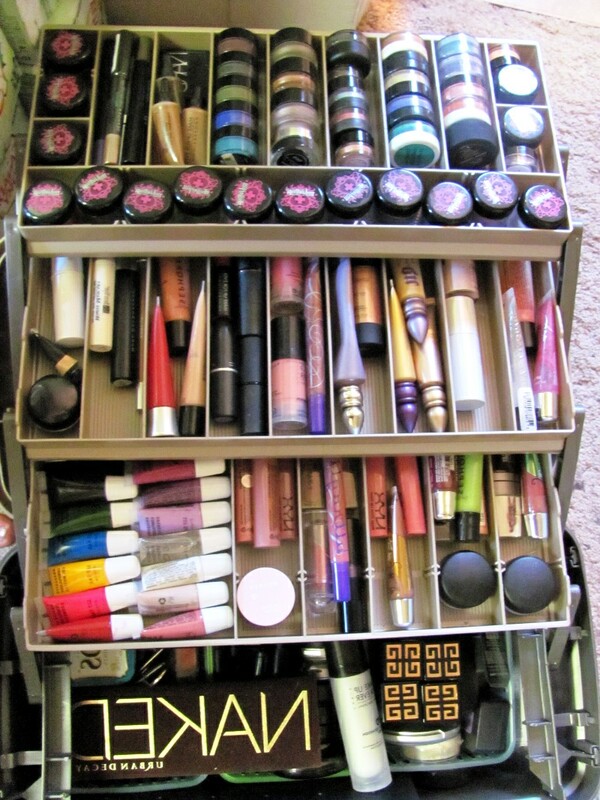 This does not include the cloth container I store my brushes, lipstick, foundation, and eyeshadow palettes in. This is just the loose pieces! 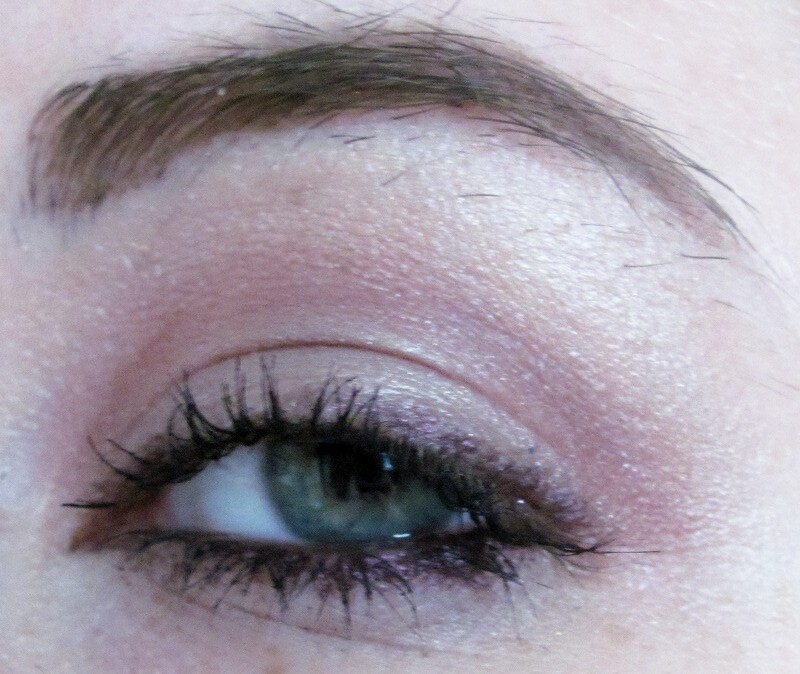 Anyways, here’s a quick EOTD. It’s the ONLY makeup I’ve worn in weeks. One of the MUA’s in my area has been kind enough to talk with me about my work, and offered me some products she no longer uses. So I’ve been testing out a bunch of new things. She gave me quite a few shiseido and Benefit eyeshadows, and a range of other things. I feel bad I haven’t been able to test them more, since they seem to be quite fun, and I have comparatively few pastel colors. Hopefully I’ll have some new stuff to show soon! Life has been crazy lately, between family issues, lots of shoots, computer problems, work problems, and an insane stress level. I haven’t been fit for human company. Since I can’t post pictures, I may as well post a few quickie notes! 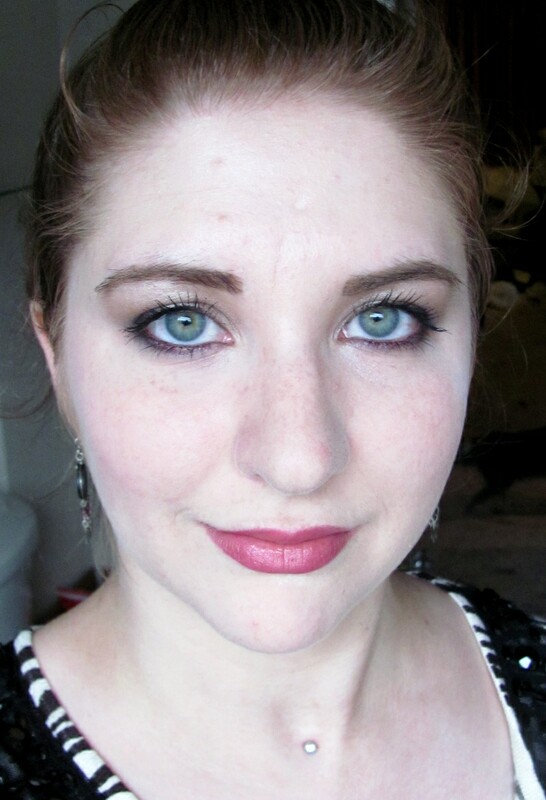 Last products I LOVED- NARS Grand Palais eyeshadow duo, Tokidoki Carnivora eyeshadow, NARS Dogon eyeshadow duo, Sephora lip gloss, UD primer in Eden, and Sin. 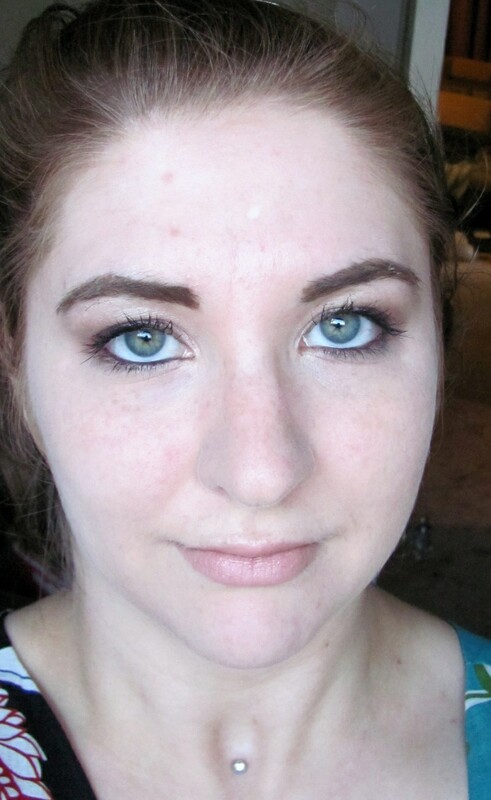 Last product that FAILED to impress me-Benefit Stay Don’t Stray eyeshadow primer/concealer—it creased, over long wear. Also, I didn’t care for NARS Casino—-on myself. On some of my models, it’s STUNNING. 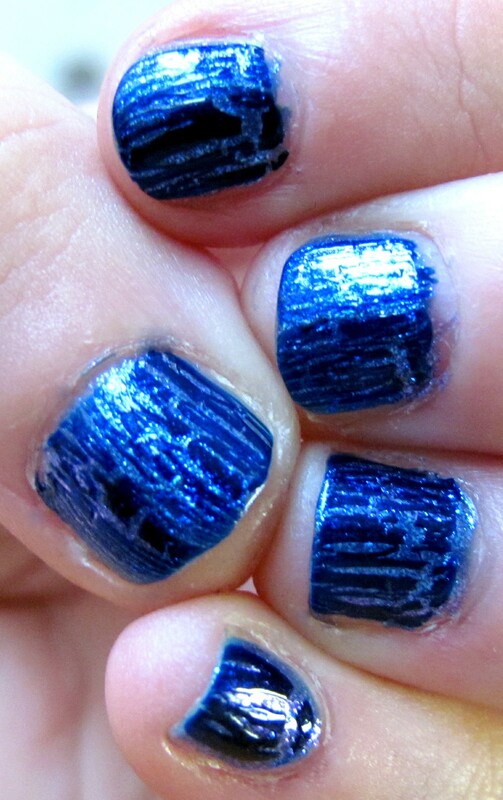 Layer Sally Henson Laser and DVD HD nail polish, and apply OPI Navy Shatter over top. THese are considerably richer in person—they GLOW bright indigo, and the sparkles show through the shatter, since it isn’t totally opaque. It changes between periwinkle, and aqua, depending on the lighting. 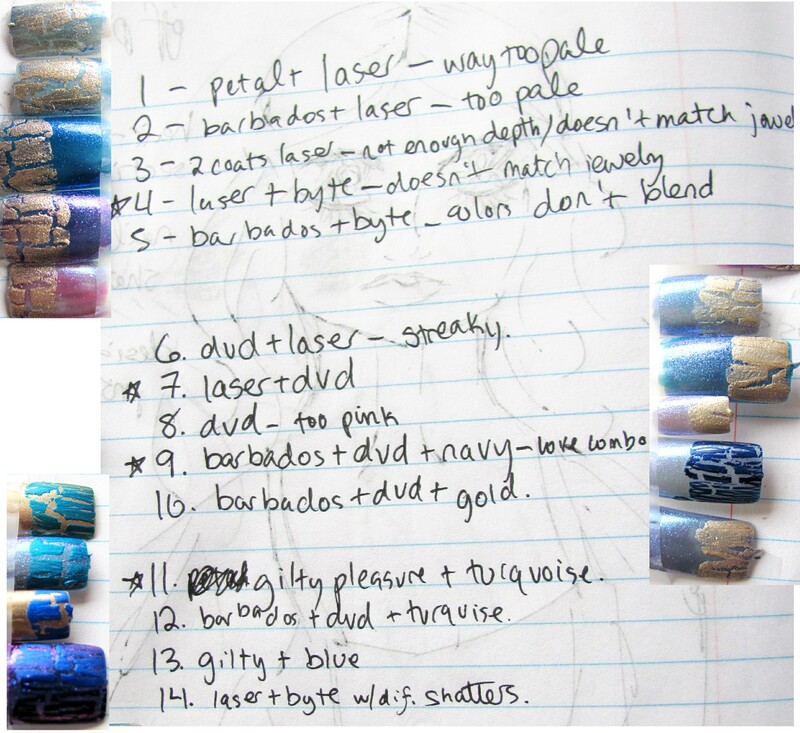 A few nail polish experiments…. 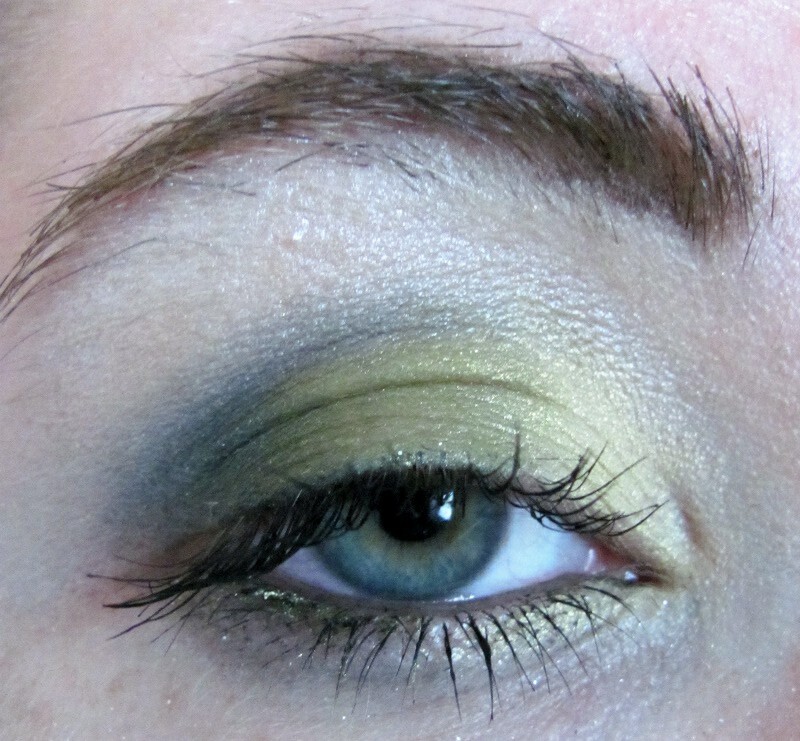 I was testing color combinations for a shoot I have this weekend. Will show pictures when that is done. In the meantime, here's a bit of pretty! Colors used are Sinful Expressions-Nights in Barbados, Sally Henson Byte, Laser, and DVD HD nail polish, and Sally Henson Gilty Pleasure nail polish. Shatter used is Sally Henson Antique Gold, OPI Navy Shatter, Blue Shatter, and Turquoise Shatter.